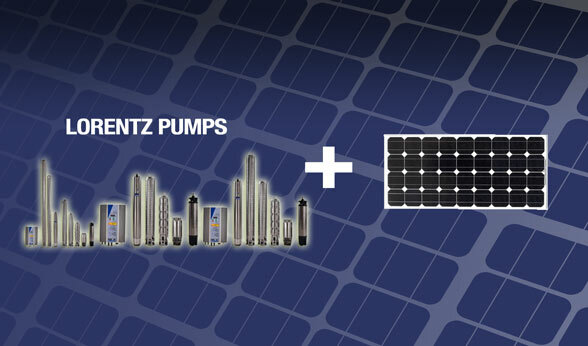 ...Lorentz Pumps & Agriculture Solar Powered Water Pump Power Increases Efficiency, Lowers Costs and Maintenance. We offer tailor-made solutions that work with you to create energy cost savings. LORENTZ Pumps and Agriculture Solar technology uses the power of the sun to pump water, sustaining and enhancing the life of millions of people, their livestock and crops. — Sun. Water. Life. • Large range of pumps and power to closely match each application and optimize efficiency. LORENTZ Pumps and Agriculture Solar technology products are built for off-grid, rural and often hostile environments. This means we design and build projects that are efficient, reliable and simple to service if anything should ever go wrong. The need to irrigate agricultural land efficiently, economically and sustainably is critical for industry security. Costs for irrigation using diesel power are rising at >10 % per year. LORENTZ Pumps and Agriculture Solar irrigation solutions produce no emissions, generate no noise. LORENTZ solar pumps complement the design of drip irrigation systems, delivering water precisely and efficiently to individual plants. Very high volumes of water for large scale irrigation are supported through a wide range of pump sizes and vertical lifts. LORENTZ solar pumps and Agriculure Solar energy system irrigation solutions are an attractive alternative to fuel-only powered pumping and support sustainable agriculture. At Agriculture Solar, Lorentz Pumps and Agriculture Energies can be your simple water pump solution. Efficiency is making the most out of the sunshine you have, an efficient solar pumping system. We say though, make the best out of your money. Efficiency includes a proper price, a high durability, and performance. Cost of solar pumping is hidden in unexpected repair works, maintenance, replacement of parts etc., especially in remote places hard to access. LORENTZ Pumps and Agriculture Solar avoids this cost through electronic controlling, outstanding manufacturing quality, and a simple design. Agriculture Energies systems have been dedicated to modern agricultural irrigation and successfully active in the top irrigation fields for over 10 years and continues to bring the tried and true principles and advantages of solar hybrid power. Think about it, and then make your move. Let Lorentz Pumps and Agriculture Solar water management provide you with decades of reliability and lasting value. We invite you to explore the possibilities of our reliable hybrid solar powered pump solutions.